We are proud to announce our new product Tracealyzer for On Time RTOS-32, targeting On Time RTOS-32 from On Time Informatik GmbH. On Time RTOS-32 is a real-time operating system for x86 processors and provides a subset of the Win32 API. 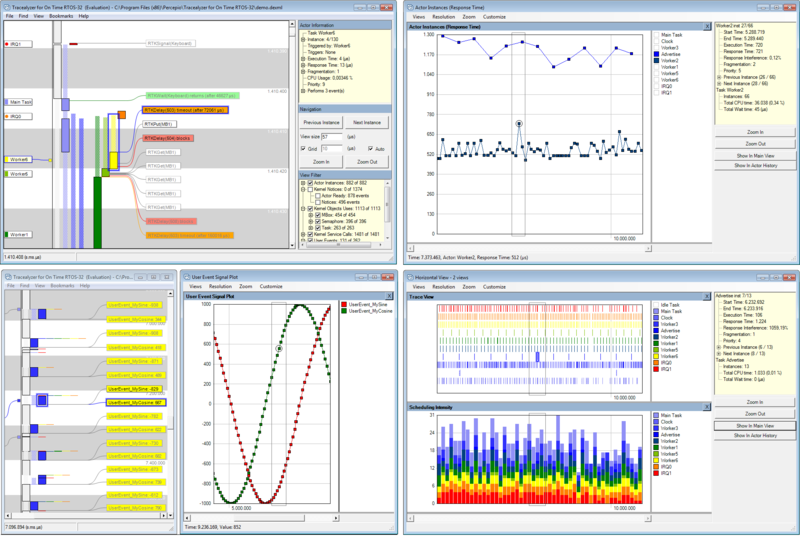 Tracealyzer for On Time RTOS-32 is based is the first product released using the new v2.3 core, which is a major update. The new version provides over 20 different views of the runtime behavior, allows for combining multiple views on the same timeline, and much more. This product has been developed in partnership with On Time and uses the already available Kernel Tracer in On Time RTOS-32. Percepio provides a simple Trace Extractor utility, that reads the Kernel Tracer data structure and generates a Tracealyzer-compatible XML recording file. The Kernel Tracer is already integrated in On Time RTOS-32 and easy to use, which makes it easy to get started with this solution. Read more at the Tracealyzer for On Time RTOS-32 product page.